First and foremost I want to mention my competitors. Bob, John and Atsatsa are all talented smiths and genuinely pleasant people to be around. From the first night together we formed a friendship that grew stronger as the competition progressed. I've rarely met another bladesmith that didn't like to sit around and talk shop and this group was no different. Unlike many other 'reality shows' there really is a sense of shared experience among the competitors that is readily apparent when you watch an episode. Atsatsa brought a unique perspective with his Native American background and you can see that influence in his work at https://redkrow.com/. Atstatsa is an all around talented artist, he's got a bright future ahead. John's bladesmithing endeavors can be seen at 12 Stitch Blades where he makes some really great blades that are designed for hard use. When John isn't forging blades, he's keeping criminals off the streets as a law enforcement officer, he and Doug Marcaida had a lot to talk about. 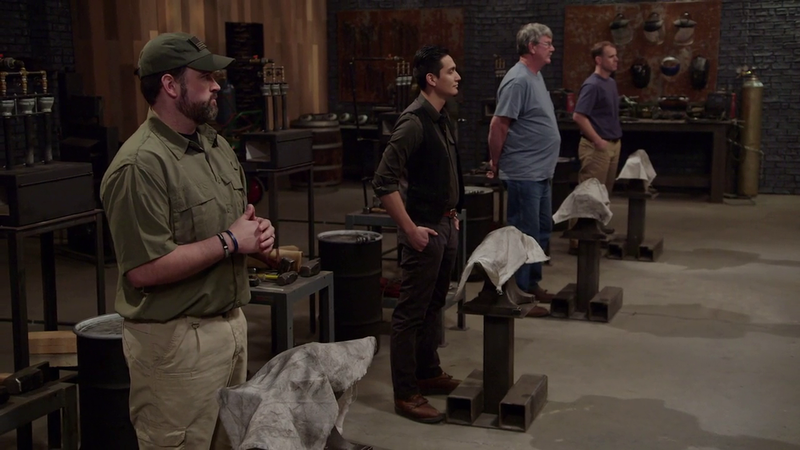 Bob is a professional blacksmith with 30 years of experience and Bob brought a lot of that experience to bear during the competition. Bob and I were assigned workstations next to each other in round 1 and 2 and we hit it off pretty quickly. We chatted a lot and just generally had a good time together throughout the entire show and into the finale. Bob has some really nice damascus patterns he's been working on, he's not super-active on social media but you can follow him at @blacksmith_bob on Instagram. All of these guys are talented smiths and it was a joy to get to experience the crucible that is the Forged in Fire experience together and I'm glad to be able to call them friends.